The Pinktail Triggerfish has an oval emerald-green body with a flowing transparent dorsal fin and a pink tail. The Pinktail triggerfish is a very hardy triggerfish and great for the beginner. It can have a bashful nature when first introduced but once established can be very protective of its territory, also like many other triggerfish the Pinktail Triggerfish can be very cryptic when small. Provide plenty of live rock for grazing and shelter. The Pinktail triggerfish can be kept with other peaceful to semi-aggressive fish providing it has ample room with plenty of live rock. This fish can grow fast and a larger tank will be necessary. Invertebrates will not be safe. 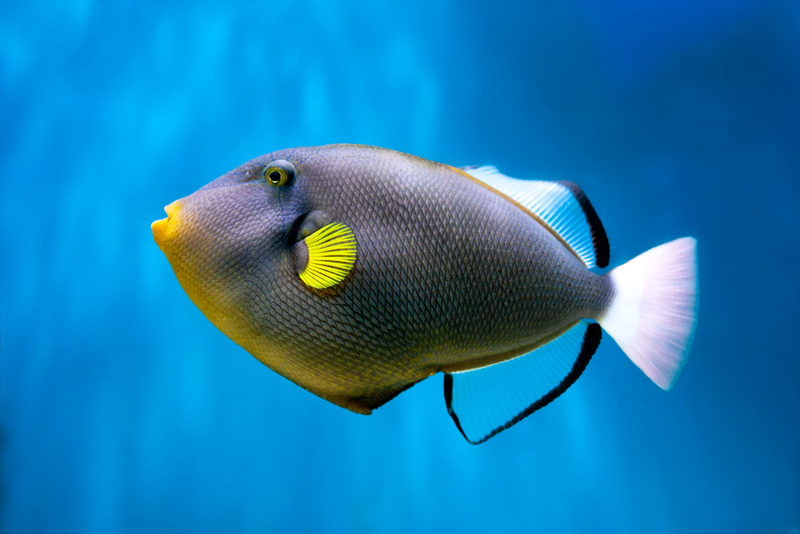 Triggerfish are durable specimens that require large tanks with plenty of live rock. They have sharp teeth and powerful jaws for crushing. Belligerent triggers will attack all invertebrates and most will try to rearrange live rock. Keep in aggressive fish only tank with few exceptions. It is best to add triggerfish of the same size and at the same time to prevent skirmishing. Feed a variety of meaty foods and vitamin enriched foods such as Ocean Nutrition Formula One Pellets in their diet.